After two years since Internet Explorer 8 was launched,has released the final version of its latest web browser, Internet Explorer 9, available for download. Thanks to powerful competitors (Google Chrome and Mozilla Firefox) and the declining usage of Internet Explorer in general, Microsoft was forced to rebuild Internet Explorer not only to run faster (and to be more responsive), simpler and more secure, but also to be redeem itself in the eyes of web developers and standards-savvy designers against the bad reputation of being a non standards compliant browser. The first thing you'll notice when you run Internet Explorer 9 for the first time is its new, simplified and minimalist interface. There is a single location bar for searches and URLs (similar to Google Chrome) and the browser tabs opens on the same row as the location bar in a single strip alongside. There are of course, pros and cons associated with this. The benefit is clear - more browsing room. Although, if you open several tabs at the same time, it becomes difficult to distinguish the tabs. Among other news, the Stop and Refresh buttons live now inside the location bar along with the search drop-down menu icon. Also, all items associated with print, safety and other controls have gone now into the Tools menu. As Internet Explorer 8, the browser has tab sand-boxing. This feature prevents the crashing of your entire browser in case something goes wrong with a tab (i.e. freezes) and it will offer you the possibly to resurrect that tab. Moreover, when you open a 'New Tab' page, you'll be able to open closed tabs and previous browsing sessions among with the most frequently visited Web sites. As Google Chrome, IE9 allows you to drag a tab to create a new browser window. Additionally, the browser integrates with the Aero Snap feature in Windows 7 in order to drag a tab to a side (right or left) on your monitor, which makes it easy when you want to look at two sites simultaneously. Another interesting feature of IE9 is that you can pin specific sites to your Windows 7 desktop taskbar. To do so, click and hold on a tab and drag it to the taskbar to pin. This is quite useful, especially for sites we visit on a frequent basis. 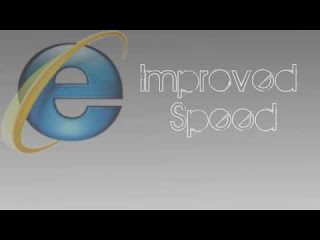 The most important focus of IE9 it to be a safe, secure and private browser. In this manner, there are two main features. One is called ActiveX Filtering which once turned on, it will block all ActiveX controls from being loaded on websites, unless you choice to allow them on a particular website. In short explanation, ActiveX controls (e.g. Adobe's Flash Player which is safe, of course) are like small plugins you can install on your computer to enable your web browser to run small programs to display content. But, there are a lot of unsafe ActiveX controls out there and also a lot of unsafe websites which will add exploit holes in your system. Another addition to 'safe and secure' is the Tracking Protection which enables you to keep sites from tracking your activity across browsing sessions. Moreover, the tracking protection feature a Tracking Protection Lists. These are lists of websites that IE9 will block from loading on your computer, therefore they will be unable to track you since they cannot load the image or animation required to track you or run the tracking code. Finally, the SmartScreen Filter will warn you if you're downloading a known virus, before you run the file and also if you're downloading a file that hasn't been verified as safe. As expected, the other security feature built into the browser, called Protected Mode, which stops Internet Explorer 9 or ActiveX controls running in the browser from accessing the system to make malicious changes. Pluses: HTML 5 compatibility, address bar search function, ability to pin Web site shortcuts to taskbar in Windows 7, hardware acceleration, fast. Drawbacks / flaws: Slow install, forces a reboot, does not work in Windows XP, requires SP2 to work under Windows Vista, there are a number of features that only work on Windows 7. In conclusion: With all this being said, IE9 is fast and highly usable, actually, even enjoyable to use. Looks like Microsoft has put together all their focus to give Web users good reasons to at least give IE 9 a try.